Q. How do I login to Browzine? 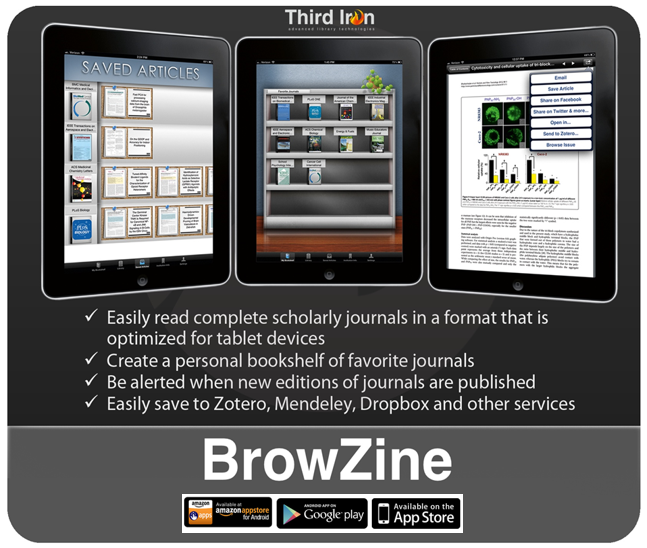 BrowZine is a tablet application that lets you browse, read and monitor EKU's subscribed scholarly journals right on your mobile device! Or, if you prefer reading on your laptop or desktop, BrowZine for the Web is a great option for reading scholarly articles. NOTE: You will not find every EKU-subscribed journal in Browzine. Browzine focuses on scholarly journal content. Often, aggregated journal packages include a large number of non-scholarly titles, such as trade publications and popular magazines, and these will not be included in BrowZine. For example, although EBSCO's Academic Search Complete includes articles from magazines such as Organic Gardening, 60 Minutes Magazine, and Road & Truck, these fall outside the scope of BrowZine. However, titles such as Annals of Internal Medicine will be included. A full list of publishers currently supported by Browzine is available here. You may also make a content request for Browzine to add a journal to their platform via their Content Request Forum.